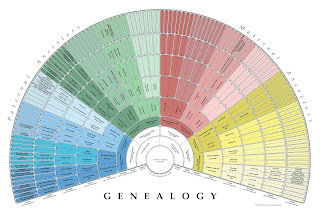 A few months ago I was introduced to a really awesome tool to help move forward in family history work. It's called a fan chart. There are a lot of places you could make (or have made) a fan chart. It's basically a diagram of one's family tree, starting with you at the center, and branching out to your parents, grandparents, and so forth. What's great about it is that it allows you to easily see where there is information lacking, and it helps you get direction on where to begin research as a result of seeing those gaping holes. The one above was created at a site located at www.createfan.com. It's super easy to use, especially if you have a familysearch.org account. (If you're LDS, this is also the same as your lds.org account, as they've all been synced.) Simply go to createfan.com, click on login, and then once logged in, click on "create fan". A box will pop up, asking if you want to open or save the file. Upon opening it, you can view your personal pedigree. Some of us have a lot of information on our fans, and some have nothing. If you have nothing, it means you haven't linked up to your ancestors on familysearch.org. This is not a problem, and is easily remedied by spending a bit of time on that website, connecting yourself to any listed deceased ancestors. And if you don't think you have any listed there, you'll most likely be surprised to find that your ancestors are there - you're just not connected yet. For me, it just took a short bit of time to link up, and voila! Connected! A very cool, useful resource in helping sort out one's genealogy. Let me know if you give it a try! 6 Month Challenge... TA DA!! !